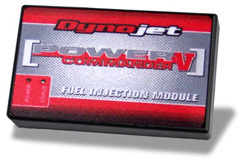 The Power Commander V 17-028 is supplied with a base map stored for the Kawasaki ZX 10R 2011-2015 in the microprocessor. This (base map) is typically a map that has been developed to provide an improvement for most combinations matching the map description (i.e. stock bike or performance exhaust and air filter). The Power Commander Software and different maps for the Kawasaki ZX 10R you get from the Manufacturer here to Download. Wich map for your bike is availible you see here. PCV does NOT allow adjustment of the closed loop area unless you are using the Dynojet O2 Optimizer part 7612535. For using the Quick Shifter you need the Ignition Module no. 6-82 or the Secondary Fuel Modul (SFM).